Since this was 911 Patriot's Day, President Don Counts brought in his "Flag of Honor" with all of the names of those killed in the 911 attack in New York. The names are used to make the stripes. 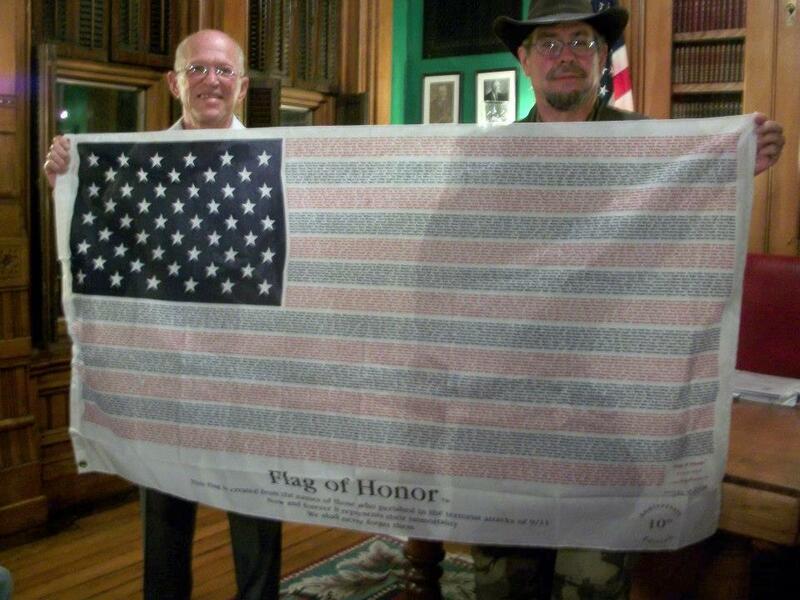 Vice-President John G. West helped Don show the flag at the meeting. With about 30 people present the Bayard Room was a little crowded. Earlier in the meeting, Special Collections Director Lyn Martin gave the library report mentioning up-coming events and informed the society that due to costs and security, all patrons needed to be out of the building no later than 8PM. Since we have been meeting at 7PM this put pressure on us to get everything in and adjourn the meeting before 8 O'Clock. The Finance Committee with approval of the TSGS Board of Directors proposed the 2012-2013 Budget which was accepted by the membership. Indiana Bones presented his "Cemetery Stories" for the program. The program was cut short in order to be out by 8PM. The society may have to meet earlier or meet on weekends to avoid cutting meetings short. "Genealogy is Like a Very Big Puzzle"